1855 Crimean War envelope and letter sent to Dublin "Via Marseilles" from "O. B. Mil/ 77th Regt Crimea" franked by three 1d Red-Brown, Small Crown, Perf 16, tied by London '49' triple cancellation - transcript of letter enclosed. 1855 Crimean War envelope to Dublin "Via Marseilles" from "O. B. Miller/H.M. 77th Regt. Crimea" franked by three 1d Red-Brown, Small Crown, Perf 16, cancelled in London - Pink Seal on the reverse for "LEICESTERSHIRE REGIMENT". 1856 Crimea War envelope addressed to "Mr.. T. J. Bines/Assistant Storekeeper/Commisarial Departt../Balaclava, Crimea/or elsewhere", franked by three 1d Red-Brown, SG 22, Small Crown, P.14, and tied by London numerals. 1855 Envelope "via Marseilles" to "Capt. Byrne/Royal Artillery/English Army/Crimea" franked by a strip of three 1d Red-Brown, SG 22, Plate 6, trimmed at top, and tied by London numerals. 1856 Officer's letter and envelope from "Thos Smith" in the CRIMEA addressed to his brother The Revd William Smith, Drayton, Cambridge - charged 6d Offier's Rate. Nice content. 1855 CRIMEAN WAR envelope addressed to Hastings "via Marseilles" SHOWING A HANDSTRUCK '3' IN BLACK APPLIED AT PLACE OF POSTING OR CONSTANTINOPLE. On the reverse is a "-POST OFFICE-BRITISH-ARMY" in black, Code B. 1855 Envelope addressed to the Crimea franked by three 1d Red-Brown, SG 29, Large Crown, Perf 14, and tied by London numerals '20'. Attractive. 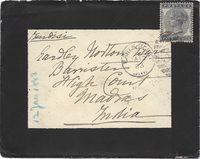 1881 1d Brown Newspaper Wrapper from London to Singapore with an additional ½d Pale Green, SG 165, both cancelled by Newspaper Contract cds. Unusual 1½d rate. 1858 1d Pink envelope to Mount Zion, Jerusalem (stamp removed) showing on the reverse, a very fine FRESSINGFIELD (under Harleston), Suffolk, undated circle. 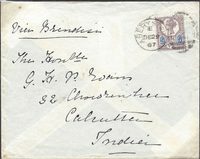 1884 1d Pink Stationery Envelope addressed to India "Via Brindisi", franked by a 4d DULL GREEN, SG 192, and tied by a very fine FULHAM '46/B' duplex. VERY ATTRACTIVE. 1860 6d LILAC ON AZURE PAPER, SG 68a. A very fine example tied to envelope to South Africa by a very fine London '87' duplex. A SCARCE STAMP ON COVER. RPS CERTIFICATE 2017. 1883 5d Indigo, SG 169, tied to mourning envelope to India by an EARLS COURT duplex. 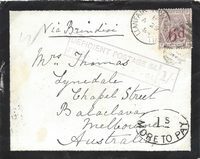 1884 4d DULL GREEN, SG 192, tied to Printed Envelope addressed to "LIFU, LOYALTY ISLANDS, NEW CALEDONIA, SOUTH PACIFIC" by a very fine London SE/3 duplex. A Scarce Destination.